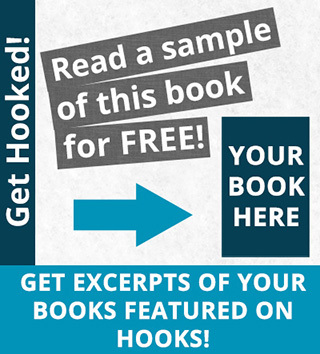 Get your book excerpt featured here on Hooks! Learn about why you should and then how to get it featured! Why offer an excerpt for free? Free has a specific and advantageous psychological effect on people. They like to know they are getting a bargain. It is no secret that people flock to free stuff. eBooks Habit has thousands of people who receive their daily email filled with free books. Readers love free! Free is good for authors too. It allows readers to take a chance on you since they don’t have anything to lose. Getting people’s eyeballs reading your work is the goal, and by offering free excerpts of your book, it provides another avenue for people to read your great writing. But doesn’t Amazon already offer a free sample? A fair question. Yes, Amazon does feature a “Look Inside” feature with a sample of your book. Unfortunately, you have no control over the length of the sample, what section is sampled or anything like that. So, while their free sample exists, it is not ideal. Plus, the “Look Inside”/sample feature doesn’t even work on mobile phones without having to have the sample sent to your Kindle app, switch apps, and then wait for the download to finish, etc… ugh! Plus, even if Amazon features a free sample of your book, people have to find out about your book, get to the Amazon page, to even get to where they can read your sample! That’s where Hooks comes in to save the day! Here at Hooks, you can feature an excerpt from any part of your book. You can provide a short “Get Up To Speed” intro so the readers know what they are reading! Plus, Hooks looks awesome on a PC, Mac, and especially on mobile phones! People can read your sample while on the go and it looks amazing on pretty much every device! Plus, we help with discovery of your book too! Readers can go to random Hooks from many areas of our site, and every Hook can be randomly chosen! We provide you with multiple banners to promote your Hook, and we will promote your Hook on our various Twitter accounts plus a few random Hooks will be featured to the thousands of eBooks Habit readers in each daily email! To have your Hook featured here on Hooks, you have two options to choose from! The Standard package is great, and you can upgrade to VIP at any time in the future if you’re not ready to start with VIP! Sorry, we are not accepting new orders for Hooks at this time. How long will the excerpt last on Hooks? I can’t tell the future, but I am committed to running Hooks for 5 years at the minimum! Obviously, the industry may change, the Internet may change, and the world may change. We plan to keep eBooksHabit and Hooks going indefinitely, and hope to host your excerpt for a lifetime! Obviously, we can’t guarantee that, but that’s definitely the goal! eBooksHabit has been around for a while, and we have no plans on stopping any time soon! Scroll up now and get started! Don’t miss out on the opportunity to feature your excerpt in a beautiful, mobile-friendly format that assists you in selling more books across all platforms!